Mailshell's Anti-Spam SDK provides complete and consistently accurate protection against email fraud, phishing and spam. The solution includes a locally installed SDK built on Mailshell's state-of-the-art artificial intelligence (AI) engine, as well as access to Mailshell LiveFeed, a real-time cloud-based data service that quantifies traffic reputation via advanced statistical models. Simplest, most reliable and most accurate way to add anti-spam functionality to existing security solutions. More than 60 data centers throughout the world ensures maximum availability and minimum latency. Mailshell "Auto Config" makes integration simple. Dozens of options offered for optimizing memory usage, throughput and detection. Easy-to-use multi-threaded development library for fast and simple integration. How Does Mailshell's Anti-Spam SDK Work? SpamBulk Engine: Is the message or similar messages sent in bulk? SpamRepute Engine: Do most people want the message? SpamContent Engine: Will most people consider the message offensive? SpamTricks Engine: Is the message formatted or sent to bypass anti-spam reputation checks or to be economical for spammers? For every message, the four fraud identification engines utilize more than one million reputation queries, pattern matches or rules to identify spam with an incredibly high accuracy rate, and a near-zero false positive rate. Additionally, Mailshell LiveFeed, a cloud-based reputation data platform offering comprehensive and granular URL category databases, provides real-time analysis from Mailshell's global data network of more than 60 data centers. The results of all of the engines are combined using SpamScore, a proprietary statistical formula, into one final spam probability score. 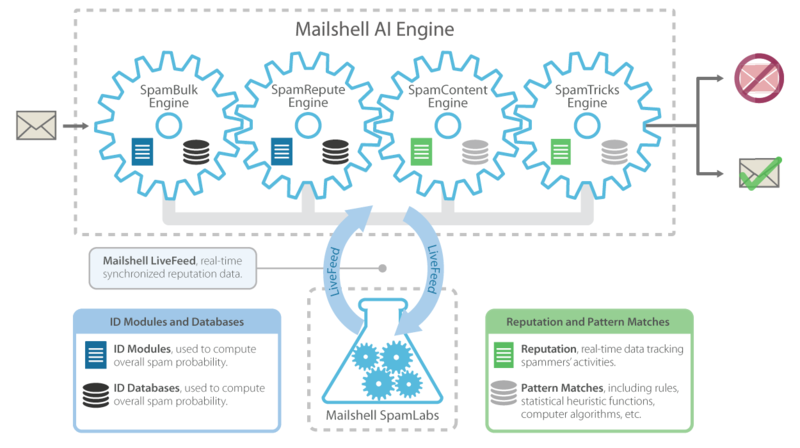 Since email fraud, phishing and spam constantly evolve, Mailshell's Internet Security Lab continuously collects and analyzes millions of new spam and legitimate messages and user feedback to tune reputation checks and databases and adjust the weighting of lookups.